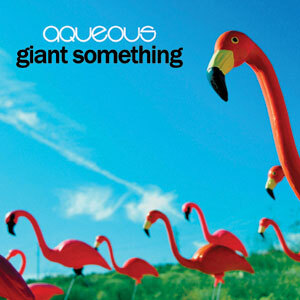 Buffalo area progressive rock jam band Aqueous (www.AqueousBand.com) has released their first full length studio album, “Giant Something”. Born at Nietzsche’s (Allentown – Buffalo NY) on April 16th 2011, this album is a brilliant mix of stunning vocal harmonies, mind blowing guitar riffs, funky smooth bass lines, tight driving drums, and hints of percussive ear candy. As you make your way from beginning to end of this album, you’ll find it has seemingly been intentionally laid out – similar to their set list at any given live show. There’s a smooth flow that makes sense from one song to the next – from the first song all the way through to the last. You get the feeling that you are spending a day in the life of someone that seems oddly familiar but you just can’t put your finger on exactly who is the star of this story. Opening with “Mosquito Valley Part I”, a short but sweet instrumental track, you immediately get the feeling that things are starting out to be a nice, sunny day. A climactic ending drives us right into “Marty”, where the guitar melody seems to be infected by a Super Mario Bro’s influence. The opening lyric, “Good old Marty takes the bus to school every day…” starts us down the path of some interesting story telling that can be found on nearly every song. In “Dig It Good” and “Cellino” you get to hear the guitars show off some harmonizing, along with some very pleasing vocals. You’re also treated to some southern rock style Guitars, and a short solo reminiscent of David Gilmore. Briefly continuing with the Pink Floyd influence, you are lead right into “Triangle”, which continues to show off the guitar and vocal styles, as well as some nice instrumental breakdowns. “Sasquatch” is a very cool instrumental that will undoubtedly have you replaying this tune over and over. It does a great job of continuing the “story”, setting you somewhere into the middle of a now rainy day, and bringing you back down from the driving sounds that have been building since the album started. An ending guitar effect effect leads right into “Phase III” and back into the thick of the album, where the 70’s Progressive Rock influences on the band really come through. “Conducive Melodies in D” treats you with the beauty of simplicity. Acoustic guitars are all throughout, with subtle hints of some electric guitar, and vocals on a simple, beautiful song. “Eon Don” once again showcases the talent and influences this band has to offer. Wrapping up the album is “Mosquito Valley Part II”. Continuing with the theme of the album, you can feel that this is indeed the end of the ride, the last song – the “day in the life” is coming to an end. Nice grooves, awesome bass lines, and you finally get some keys being tickled on a Mini Korg synth. All around, this album is done very well. The song writing is very interesting, and the fact that it is self produced does not take away from the overall sound quality. The vocals are impressive and come in and out of the instrumental sections as expected. While drums and the subtle percussion fills are tight, I would have liked to hear some subtle solo-style drumming and more prominent percussion. The bass lines groove, funk, and walk around very nicely. The guitars pass around melodies and come together on harmonies flawlessly, although it would have been nice to hear some longer solos. It also would have been nice to hear the synth just a little bit more – although to be fair, the synth doesn’t typically see a lot of airplay at their live shows. “Giant Something” gives me a feeling of a themed album with an intentional beginning, middle, and end, and the songs blend together nicely. Aqueous is known for their attention to detail at each of their live performances, and that shines through here on this album. With just a few minor subjective tweaks, their next album should be one to launch them further into a leading role in the progressive rock jam band scene, and I look forward to hearing it. Buy the album at CD Baby now! Awesome article bud, very nicely written!